1. Bella called and called Jacob to try to find out what was wrong. Do you think it was the right thing for him to try to just ignore her and move on? Or do you think Jacob should have tried to get a message to her sooner? I think jacob should have tried to get the message to her sooner, i mean that was kinda harsh, how much can one person take, first she goes catatonic, then when she's finally floating again you take way her floatie and she's trashing about again, not fair. 2. What was your first impression of the "new" Jacob with his short hair and larger frame? Did you think he was frightening? Di you think he really had Bella's best interest in mind? He probably really tried, but he just couldn't tell her so yea. 3. Billy accuses Bella of leading Jacob on. Bella herself uses the term "breaking up" to refer to the end of her relationship with Jacob. Do you agree with Billy that Bella was playing Jacob, or do you think she was sincere in her feelings? I don't think she was intentionally leading him on. I think she was at a stage in her life where she really needed some happiness in her life and grabbed it by the rails when it came by and she eventually fell in love with him and as intense as edward but regardless she falls in love with him. 4. What did you think the sound was tapping at Bella's window at the end of the chapter. Did you think it was Jacob... or Edward... or Victoria... or someone else all together? I hoped it was edward, empty dreams, empty dreams. 1. Bella called and called Jacob to try to find out what was wrong. Do you think it was the right thing for him to try to just ignore her and move on? Or do you think Jacob should have tried to get a message to her sooner? I think he maybe could have handled the situation with a little more finesse. 2. What was your first impression of the "new" Jacob with his short hair and larger frame? Did you think he was frightening? Di you think he really had Bella's best interest in mind? I remember thinking "how much bigger can he get? What is going on?" 3. Billy accuses Bella of leading Jacob on. Bella herself uses the term "breaking up" to refer to the end of her relationship with Jacob. Do you agree with Billy that Bella was playing Jacob, or do you think she was sincere in her feelings? I didn't think she was playing Jacob, and she was sincere in her feelings for him. Jacob was the one who wanted more from their friendship. 4. What did you think the sound was tapping at Bella's window at the end of the chapter. Did you think it was Jacob... or Edward... or Victoria... or someone else all together I didn't know what to think the first time I read it. It was probably late at night when I read it. Location: Bear hunting in the Smoky Mountains with Emmett. 1. Bella called and called Jacob to try to find out what was wrong. Do you think it was the right thing for him to try to just ignore her and move on? Or do you think Jacob should have tried to get a message to her sooner? Jacob should have tried to get a message to her sooner. He was sort of frightening. She was aware, deep down, that Jacob had a high risk of being lead on. BUT she WAS upfront with Jacob from the beginning. She did lay in on the line for him and he said he was OK with that. "You don't know how long I've waited for you." I didn't think it was right for him to just ignore her. I think he should have at least tried to make something up that might give her peace of mind. He should have known how persistent Bella would be and that she wouldn't give up easily with no reason. I didn't think Bella was playing Jacob at all. Or leading him on, at least not intentionally. She expressed remorse and guilt several times at the fact that she knew he felt stronger for her than she did for him, but I think she was also drawn to Jacob. I think she was conflicted in that respect, she didn't want to lead him on, but at the same time she really needed him in her life. It would be a hard position to be. I think she was sincere with her feelings, but her feelings seem to govern her a lot. I was pretty sure it was Jacob because it was described as scratching and for some reason, Jacob popped into my head immediately then. I thought that it was messed up for him to ignore her. She is suppose to be his friend, his best friend. Why ignore her. Jacob should have tried to tell her something sooner. 2. What was your first impression of the "new" Jacob with his short hair and larger frame? Did you think he was frightening? Did you think he really had Bella's best interest in mind? It wasnt frightening. It was just different. I dont think he really did have Bellas best interest in mind. She was sincere with her feelings. She liked Jacob. Maybe not more than a friend, but she still did. She was hurt when Jacob didnt want to be her friend anymore. I thought it was maybe Victoria or someone who wanted to hurt her. I think Jacob tried his hardest to follow the rules, but... you all know jacob It's so much better than the first draft stephenie wrote of new moon, where jacob never broke the rules and never told bella the werewolf story. so, I think he was just being jacob. I thought he changed a lot as a character. He wasn't necessarily frightening, just serious and... different. He definitely had her best intereest in mind when keeping the secrets of the "cult" from her. I don't think she was playing Jacob, at least not intentionally. Although his feelings for her were probably stronger than hers were for him, she was just following her heart and her impulses. and given all she had been through, you really can't blame her for wanting someone for comfort. I think that he was different because all of the sudden he changes dramatically and without reason. I think he really had Bella in mind when he wanted her to stay away from her because he didn't want to hurt her. I'm pretty sure it was Jacob because he wouln't leave things like he did, on the other hand it could be Edward coming back or Victoria seeking revenge....I'm pretty sure it was Jacob though. Bella called and called Jacob to try to find out what was wrong. Do you think it was the right thing for him to try to just ignore her and move on? Or do you think Jacob should have tried to get a message to her sooner? I don't think that it was right for Jacob to ignore Bella, but I don't think he did it by his own free will. Sam Uley made Jacob ignore all of his friends so he obvisously has been brain washed. Jacob probably should of gave Bella a message earlier, but Im under the impression that his cult wouldn't allow him to do that. When I first read that Jacob had short hair and a larger frame, I thought of a solider who just got out of boot camp. He was frightening because he wasn't in a normal mind set and he looked at Bella with mean eyes. He has Bella's best interest at heart by saying that he can't be friends with her anymore. 3. Billy accuses Bella of leading Jacob on. Bella herself uses the term "breaking up" to refer to the end of her 0relationship with Jacob. Do you agree with Billy that Bella was playing Jacob, or do you think she was sincere in her feelings? Billy was just saying that to cover up what was really going on with Charlie. Bella did set boundaries with Jacob. 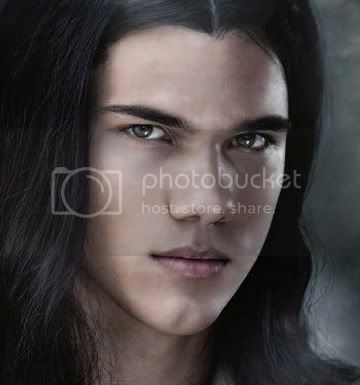 A part of Jacob has to know that Bella did not lead him on. I think Billy made that whole thing up and Jacob probably never even talked to him about his relationship with Bella. I think he was foolish to think she would stop calling. He should have just answered the phone like a big boy. I was sad about the hair, but not at all surprised that he'd grown. Jake just does that. I thought he half had Bella's best interest in mind, but half just had to do what Sam said. I think she was unintentionally leading Jacob on, but I also think she was sincere in her feelings for him. 1. I think Jacob absolutely should have messaged Bell way sooner! I mean, he knew Bella would go paranoid. I thought he was being a bit selfish, but it annoyed me how he was acting all oblivious of the situation. And Billy got on my nerves from the start. I never really liked him. 2.At that moment I had really realized that Jacob had fell into the trap. Yet, I was still confused about Sam. Thy have not explained him so much up to this chapter. So, I was not for sure that he had fell into whatever trap, because of Sam. 3.I always could relate to Bella, so i probaly just felt she was sincere in her feelings. 4.Um, well at first I kind of thought in the back of my mind it was Edward. But, that did not make that much sense. Then, I remembered about Jacob being a warewolf, (My friends told me!) But, that made me think of his sharp claws or something like that. But, never once did it come to mind that it would be Victoria. She was on the back of my mind at that point.